Paddle your way to peace. And health. 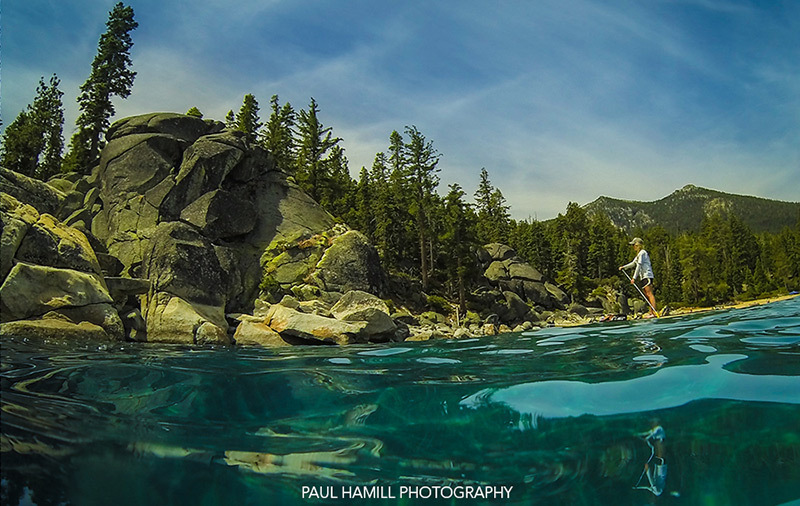 Gaze out on Tahoe or Donner on any given summer day and you’ll see a lake alive with action. Ski boats, waverunners and jet skis zip about like water skippers, with shouts of joy never far behind. 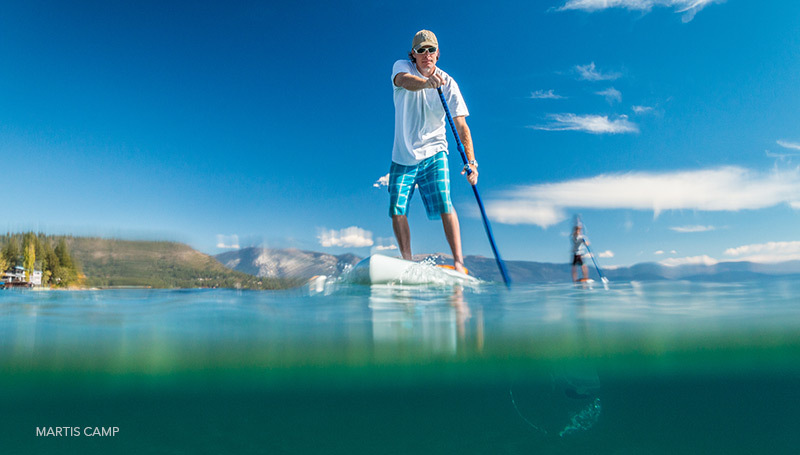 Lately, however, your scan will likely reveal a new, quieter, more easy-going armada plying the local waters: paddleboarding is the latest wave in water adventure. And Lake Tahoe and Donner Lake are prime playgrounds for this family-friendly escape. So, where to go? Glad you asked. Here are a few suggestions for some prime paddle grounds. Here’s another journey that’s not far from Martis Camp, yet delivers an experience that lingers long after you’ve put your board up for the day. If you’ve got the time, you can even consider the Beach Shack at Lake Tahoe your home beach. Simply paddle eastward toward the California/Nevada State Line until you arrive at the lovely setting known as Speedboat Beach. Sand Harbor to Thunderbird Lodge. 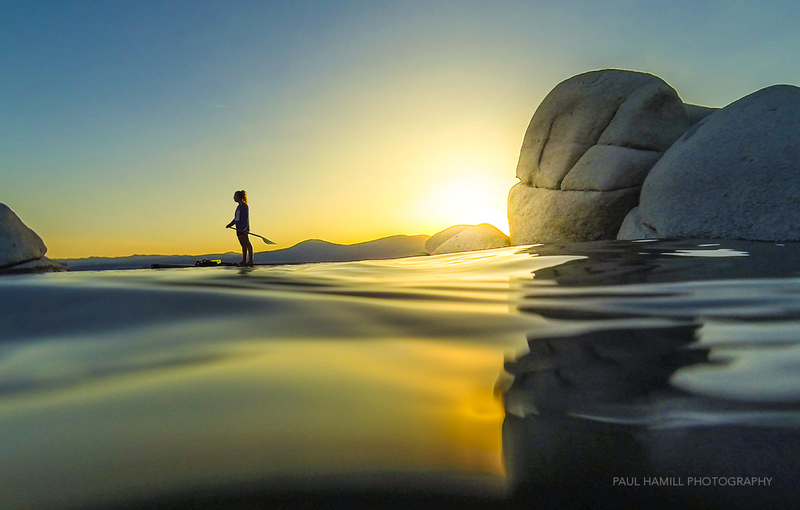 If you’ve seen those classic overhead shots of Tahoe’s gin clear waters with boulders strewn on the lake floor like a game of marbles between giants, then this may well your chance to live that scene up front and personally. Throw in the towering mountains of Tahoe’s east shore, a little morning glass on the lake, a slew of secluded beaches, and you’ve created the kind of day that memories are made of. A slow cruise to your outside destination — Thunderbird Lodge — provides a glimpse into one of the great remaining residential estates of the 1930s. Sand Harbor is three miles south of Incline Village on State Route 28. This gem of a state park is only 17 miles south of Tahoe City on Highway 89. It’s the ideal launch point for adventures along Tahoe’s quieter, more quaint west shore. Head north a short ways toward Meeks Bay and you’ll find burgers, snacks and beverages that make for a fine refueling. Point your board to the south and you can set off for a day-long paddle to that place that adorns postcards, calendars and coffee table books: Emerald Bay. The journey there and back can be calm but the popular waters of the bay make for a chop that can be challenging to novice boarders. Once you round the mouth of Emerald Bay, a scene unfolds before you that is the stuff of dreams. You know that little neighborhood lake of ours by the name of Donner? Yeah, the one that welcomes us each time we get close to The Camp. Well, not only is it beautiful, but — with rental facilities on both its east and west shores — it also makes for a great paddleboarding destination. You can paddle just about anywhere but those areas around the inlet and outlet offer the greatest pockets of peace, quiet and calm waters. Finally, you’ve got the will, the desire and the curiosity to take to the lake. Only one detail: you need a paddleboard. Not a problem. 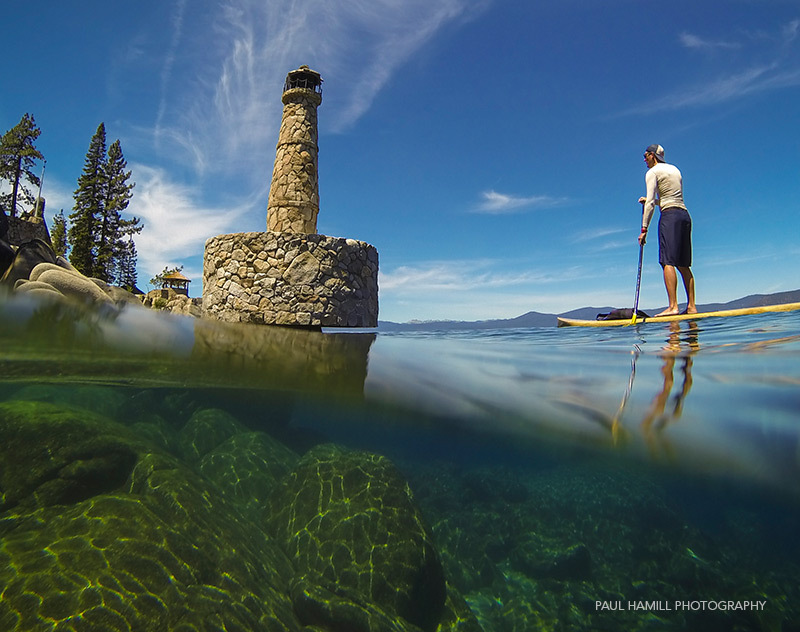 A few of your closest rental options are located at Tahoe City and Kings Beach and include standuppaddletahoe.com, tahoepaddle.com, and tahoecitykayak.com. Be sure to hydrate, lather up in sunscreen, and prepare for excess amounts of pleasure. previous post: Steep and Deep or Rinse and Repeat?